A native of Wisconsin Rapids, Wisconsin, Tianna captured the title of Miss Wisconsin 2018 in June, 2018. Tianna is an inspirational example of determination and perseverance, as her journey to the state title spanned eight years, eleven local competitions and six state competitions, the last of which was only made possible by the Miss America Organization’s extension of the age limit, enabling her to take one last shot at earning the title of Miss Wisconsin. A trained dancer since age five, Vanderhei performed a lyrical dance for the talent portion of the competition. At state, she earned the Overall Dance Award in honor of Ken Morrall, Overall Interview Award and Miracle Maker Award. In total, Tianna has earned more than $20,000 in scholarships to utilize toward her education over the course of her involvement with the Miss Wisconsin Organization and its local preliminary competitions. At the 2019 Miss America Competition, Tianna won the first-ever Preliminary On-stage Interview Award and landed a spot among the Top 15. Her strong performance at the national competition earned her an additional $5,000 in scholarships. ​Tianna graduated from the University of Wisconsin-La Crosse in 2015 with a Bachelor of Science degree in Organizational and Professional Communication Studies and a minor in Sports Broadcasting. Upon graduating, she worked as a Multi-Media Journalist and Fill-In News Anchor for WXOW News 19 in La Crosse, Wisconsin before relocating and pursuing a position in advertising sales. Following her tenure, she hopes to pursue her master’s degree in marketing or communications. ​During Tianna’s year of service to the state of Wisconsin, she is promoting her social impact initiative, “B.O.S.S. – Building Our Soft Skills, Strengthening Our Future,” while simultaneously serving as a Goodwill Ambassador for Children’s Miracle Network Hospitals, the national charity partner of the Miss America Organization. Her social impact initiative grew out of her personal trials and tribulations. While pursuing an athletic training degree in college, she began struggling with coursework for the first time in her academic career. Upon switching her major to communication studies, she immediately recognized the critical role “soft skills” play in opening doors and paving the path toward success for both students and those in the workforce. 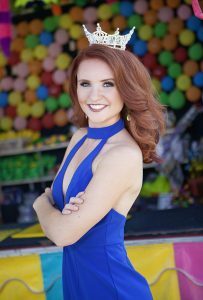 ​As Miss Wisconsin, Tianna’s mission is to help people become the “BOSS of their future” through the development of vital soft skills that will give them an advantage in their careers and lives. In sharing her tribulations and successes from her eight-year journey to capture the state title, she expands on the invaluable skills that helped her reach her goals. This message resonates with people of all ages and stages – from grade school children to high school and college students through adults actively in the workforce. With inspiration and mastery of these critical skills, each person can become the #BossOfMyFuture, conquering any challenge that comes his or her way.